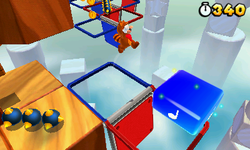 Super Note Blocks (formerly known as Magic Note Blocks or Red Jump Blocks) are objects derivative of Note Blocks that appear in Super Mario Bros. 3 and Super Mario 3D Land. When a player presses the jump button just after landing on one, they will ascend into a Coin Heaven. In Super Mario Bros. 3, where they are pink, the player simply must follow a trail of coins to the end. In Super Mario 3D Land, where they are twice as long, have a white note instead of black, and flash a rainbow of colors, they usually give the player a Super Star used to run through a group of enemies, or a platforming section that requires use of the 3DS's stereoscopic 3D, in order to receive a Star Medal at the end. They are replaced by Cloud Cannons in Super Mario 3D World. ↑ Nintendo Power Volume 11, pages 10 and 11. ↑ "This Magic Note Block Launches Mario Into Coin Heaven! Kick the Koopa left so he clears away some of the blocks, then jump into this space to make a Magic Note Block appear. Jump on it and press Up to get to Coin Heaven. Once there, run back and forth to get the speed you need to fly. In the sky, at the middle of the stage, is a 1-Up!" - Nintendo Power Volume 13, page 12. ↑ "Keep an eye out for special Red Jump Blocks, which will warp Mario to Coin Heaven." - The Super Mario Advance 4: Super Mario Bros. 3 Player's Guide, page 10. ↑ Shogakukan. 2015. Super Mario Bros. Hyakka: Nintendo Kōshiki Guidebook, Super Mario Bros. 3 section, page 41. ↑ Shogakukan. 2015. Super Mario Bros. Hyakka: Nintendo Kōshiki Guidebook, Super Mario 3D Land section, page 185. This page was last edited on April 5, 2019, at 09:23.